This 2016-17 season Alaska returned to a more typical weather pattern which many long-time Alaskans are used to; cooler temperatures with snow to sea level, interspersed with dry, windy periods. Interior regions and the Kenai Peninsula were blanketed with more snow than average, while some coastal areas went dry. Despite the variances, Alaskans enjoyed an overall more typical snow season riding, skiing, and recreating in avalanche terrain. Several storm cycles created multiple days of high avalanche danger. The AAIC team worked hard to keep the public informed of these conditions. The five community avalanche centers that make up the AAIC, provided 517 avalanche forecasts, received numerous observations, taught education outreach, and contracted avalanche safety services for companies and organizations that reached from Haines to Fairbanks to Valdez. Partnerships with cities, boroughs and municipalities have continued to grow and strengthen along with support from local newspapers, radio, snowmachine clubs, universities and the Alaska Department of Public Safety. During this season the AAIC education team taught a total of 46 community awareness and general backcountry preparedness courses, seven AIARE Level 1 & 2 courses, and the first AIARE Motorized Instructor Training Course (ITC) ever held in Alaska in December. This course was hosted in Valdez with participants from Alaska and beyond including: New Hampshire, Colorado, California, and Kashmir. The community courses included school children from 1st grade through High School, as well as community organizations and groups. 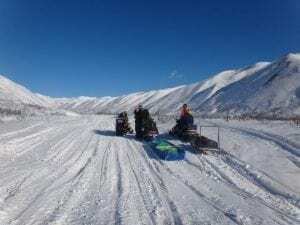 The Backcountry Safety program ‘Live to Ride Another Day,’ was sponsored by the Alaska Department of Public Safety, Division Alaska State Troopers and reached more than 3,000 individuals in communities across the state from Anchorage to Ketchikan to Fairbanks to Valdez. Anchorage just prior to the Southcentral Alaska Avalanche Workshop, hosted by CNFAIC November 4. The objective of this Summit is to bring together individuals, companies, organizations and state agencies who utilize and benefit from the snow safety services provided by avalanche practitioners in order to meet, network and brainstorm better ways to serve Alaskans. The 2017 Summit, sponsored by Conoco Phillips, is set for Thursday, November 2, 2017 at Alaska Pacific University. More details coming soon at www.AlaskaSnow.org. Alaska reported two avalanche fatalities during the 2016-17 season. A snowmobile rider caught and killed while riding near Cooper Landing on the Kenai Peninsula, and a four-year old girl in North Pole buried and killed in a roof avalanche. The AAIC team continues to work hard to raise awareness and share information about avalanches in Alaska. Following is detailed information from the five current AAIC community avalanche centers. our local ski lift to operate for the first time in as many years. The snow pack slowly increased into February. However, mid-month, brought 5 inches of water in 2 days with the freezing line climbing above our local peaks, causing large avalanche activity. Strong northerly outflow winds then scoured the upper peaks, followed by a month long drought. Snow returned by April along with more avalanche activity. High daytime temperatures towards the end of April began our spring shed. All in all, the ­average winter temperature sat slightly above normal; below normal winter precipitation combined to bring a slightly below normal maximum height of snow. No avalanche activity reached the highway. The Eastern Alaska Range once again saw long periods of drought this winter with below average total snowfall depths. Regular high winds and periods of above freezing temperatures (which seem to be the new norm) kept snowpack depths variable, with some areas remaining scoured all season long. Our second year as an organization saw continued success in collecting and sharing user observations on social media and our website. 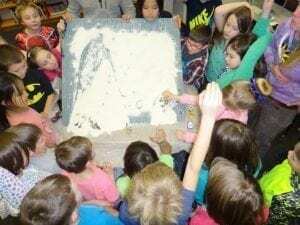 We were also able to maintain and expand our education and outreach opportunities in Interior Alaska with 17 classes reaching over 400 students. 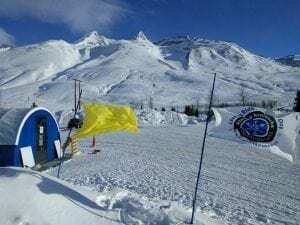 During the Arctic Man Ski and Sno-Go Classic in April, EARAC worked with other AAIC centers to provide an avalanche forecast for five days during the event and was widely regarded as a success and valuable asset to the event. Additionally, EARAC also joined forces with the Valdez Avalanche Center to issue Advisories during periods of heightened avalanche danger. 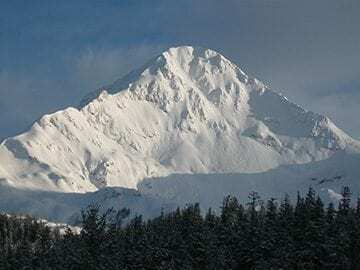 This was a big year for the Haines Avalanche Information Center, with an increase in funding from government and private sources, a busy event schedule, and ever increasing backcountry use. In terms of snowpack, it seems to have been a somewhat “average” year, with ~59″ of accumulated SWE in maritime zones and ~29″ in interior areas. Increasing backcountry use at the Chilkat pass is making our forecast there ever more important. We also provided an event forecast for the 1st annual Haines Alpine Adventure Race, which was a big success. This season brought a major increase in data availability, as we now have four new mountain weather stations online in our area. One of these stations was installed and managed by HAIC/AAIC, and has illuminated how our local mountain micro climates affect conditions. 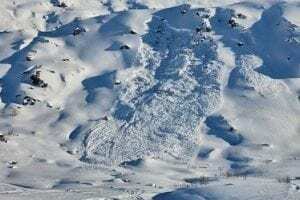 Our community has managed another season without an avalanche fatality, though there were several close calls reported, and two full burials reported second-hand but not confirmed. No doubt the pressures to not report accidents are huge. Our community is in need of more avalanche education, and a culture shift to encourage risk reduction, information sharing, and learning from our mistakes. These are ongoing goals for the future, and while progress is being made, it is a slow process. Overall, stability was good for much of the season, but this year’s outlier came in the form of a nasty rain crust-facet-NSF sandwich that formed late February and was buried by a meter of moderately hard slab. It wreaked havoc through spring, scaring the heck out of people with shotgun-blast whumping, basin-wide propagation, and remote triggering. In mid-March, most users were well aware of the danger and taking it easy. By the end of March however, a moderate increase in stability led to a large increase in risk taking, despite our warnings about deep persistent slab danger. This was the period in which burials were reported to us second-hand. The Hatcher Pass Avalanche Center had a successful 2016-17 season despite a late snow start. Even though precipitation was low, we welcomed the colder version over last year’s abnormally warm winter. This winter resembled what Alaska used to be like when the old-timers said…”It ain’t Alaska unless winter is as cold as ‘bleep’ and the mosquitoes are as thick as ‘bleep’ in the summer”. Despite a colder winter, we never received the snow dreamed about during the daily 18+ hours of December darkness. November through March ranged from about +10° F down to about -33° F, although mostly below zero. The Fishhook Basin reported 57% SWE of the official median since 1964. Low snow, cold temps and clear skies early in the season set up an abnormally weak base. By December, we received enough snow to build a persistent slab issue that lasted throughout the season. This problem started with many remotely triggered avalanches up to D2.5 which slowly tapered off with only minor blips of reactivation. Considering the sensitivity and size of this significant avalanche cycle, and the normal heavy backcountry usage in the area, it was impressive that no injuries or fatalities occurred. It appeared that after a tumultuous 2015-16 season, avalanche awareness reached a peak. HPAC provided avalanche advisories every Saturday, November through April, and additionally as warranted by weather. 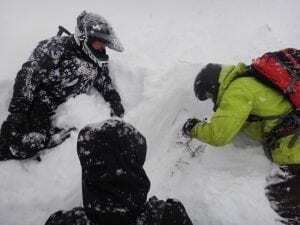 Highlights of the season included teaching our annual free rescue workshop in conjunction with the CNFAIC, the Alaska Avalanche School (AAS), and AAIC, with over 50 attendees. We also co-hosted a “Know Before You Go” class with the AAS in Palmer. This was our second season using the joint CNFAIC/HPAC observation platform. User participation is high and the clear, structured format has been very helpful. HPAC was accepted for a snowmachine loaner program from Alaska Mining and Diving in Anchorage. This machine was stored in the rescue cash at Hatcher Pass, enabling forecasters quick access, widening our core observation area, and was available for search and rescue. Local support increased this season with two different community grants equaling $7000 from the City of Palmer and the Fishhook Community Council. HPAC held our Annual Fundraiser and Cabin Fever Reliever, including silent auction, bluegrass, and local beverages. This event brought in $5000. For the first season ever, HPAC’s budget supported a small salary of $5000 for a single forecaster this season. The “Are You Beeping” sign project is on track for installation beginning this summer and autumn. Three signs with beacon checkers and solar panels, one temperature/humidity sensor, and one trail counter have been acquired. Local companies have generously donated batteries and supplies to limit costs to the center. HPAC started an Advisory Board with seven Mat-Su valley locals, and held regular monthly meetings all season. This group has been a wonderful, new area of growth for the seven-year old “Jed and Allie Show”. We are looking forward to having the strength of this group propel HPAC towards a more permanent and sustainable avalanche center. It was a challenging winter on the east side of the Chugach this year, where high pressures had a dominating presence and overstayed their welcome. Long periods of cold, dry and windy weather resulted in only eight major storms. Several wind events stripped our high elevation, dry snowpack back to its base while filling in the low-lying terrain. Minimal precipitation and destructive outflow winds compounded into a very thin snowpack with persistent weaknesses you had to tip-toe around beyond mid-season. 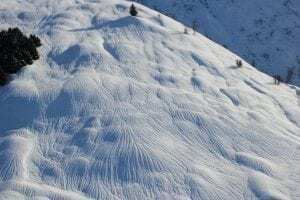 Our few large avalanche cycles were directly tied to two extreme wind events, a high reaching rain cycle and early season deep, persistent snow instabilities. In total, Thompson Pass accumulated 327” of snow (32” water equivalent), only reaching 65% (180″ short of 507″) of the historical average since 1951. 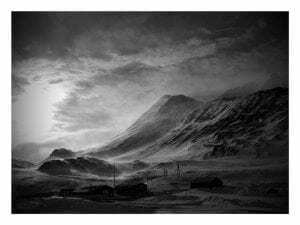 The town of Valdez experienced a much cooler and snowier season: receiving 249” (25” water equivalent), 140% more than last season, yet still 62″ short of a 311″ average since 1971. The shallow snowpack and lack of refreshes on Thompson Pass took its toll on recreationalists of all means, leading many to cancel or shuffle their spring skiing plans elsewhere. There were times where it seemed that everywhere but the Valdez area was receiving snow….quite the anomaly. But, as it always does, the Chugach magic quickly transitioned the snowpack and the great turns in paradise returned by the second week in April. Overall it was a pretty safe season near Valdez, with minimal close calls and involvements reported. As for outreach and forecasts, beginning in October, 145 daily forecasts were published this season that reached over 9,000 unique users. An average of 150 people viewed the forecast each day with over 27,000 views for the entirety of this season. Peak timeframe was in mid-February near a large rain event and in late March/early April when snow returned after a long, high pressure period. Beyond our daily public forecast, we established a remote and physical presence on Thompson Pass, offering field based education and outreach from a quonset in the heart of the camp and ski scene. VAC staff updated the forecast daily in addition to flying the avalanche hazard ‘surf flag’ colors high for all to see. Educationally we offered many awareness programs packaged as mountain skills and riding safety combined with avalanche know-how. Student feedback to this more holistic ‘mountain safety’ was very positive. We taught several traditional AIARE 1 & 2 courses, including a motorized Level 1 taught by Mike Buck and Kyle Sobek. We hosted the first ever combined motor/human powered AIARE Instructor training, making stronger connections with our motorized community. CLOSING: The AAIC team will come together for our third annual retreat in July, 2017 to continue work on strategic planning, collaboration with other avalanche service providers, and building a sustainable, long-term future to serve Alaskans across the state with avalanche information, education and backcountry travel outreach.